The Second Plenary Meeting of the Seventh Central Committee of the Workers' Party of Korea marks a turning point which put greater spurs to the all-people general offensive for the victory of socialism, meeting all challenges of history. The meeting was a significant one which demonstrated to the world the iron will of the WPK to open up the turning phase of the revolution and construction with bold and strenuous offensive and advance the socialist cause of Juche without an inch of deflection. 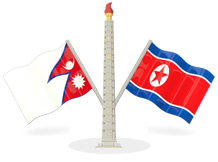 The international situation surrounding the DPRK remains very complicated. A touch-and-go situation is prevailing on the Korean peninsula owing to the U.S. imperialists who spouted out the unethical remarks unprecedented in history calling for total destruction of the DPRK and its people at the UN stage and are going reckless in the moves to ignite a war by mobilizing all nuclear strategic assets. Respected Supreme Leader Kim Jong Un at the plenary meeting affirmed that the WPK would give full play to its correct leadership ability in order to settle accounts with the confrontation with the U.S. for centuries and accelerate the victory of the socialist cause. The national power and position of the DPRK have reached the highest level and its inexhaustible potential of development is fully demonstrated day by day. The situation remains grim and a lot of difficulties and trials lie before our way but we have strong courage. All service personnel and people should go all out for the implementation of the tasks of the Second Plenary Meeting of the Seventh C.C., the WPK full of faith in sure victory and optimism and thus bring about a new upsurge in the building of a powerful socialist nation.